Just even thinking about this dessert is making my mouth water. The first time I had the “original” creme brulee tart was about 6 or 7 years ago. One of my friends brought a box of pastries over when I was cooking dinner for a chick night. I completely forgot about them until after everyone left. I opened the box to find 5 gorgeous tarts, a brulee tart, a chocolate one, lemon and I think there were a couple of fruit and almond ones too. Even though I was full to the point of bursting I couldn’t resist tasting them. About ten minutes later I had eaten 3 of them! The creme de la creme was the ginger and pistachio creme brulee tart (pardon the pun). From that day onwards I have been addicted to them. The pastry is very light, crisp and flaky and the filling is lushiously smooth and creamy with a crunchy layer of thin toffee in the top. Dribble!!! Recently I google searched “Bourke Street Bakery Brulee Tart” and managed to find a recipe on someone’s blog. I have made it twice now with great success. I made individual small tarts the first time and one large tart the second time. The pasty first time was better as I followed the instructions to the letter – second time I rushed it a wee bit and also had an oven malfunction mid way through baking the pastry blind. Never the less both worked well and were absolutely delicious. I am going to give you the recipe for the single larger tart which will serve about 8 – 10 portions depending on how greedy you are….. I recommend you make the pastry the day before and leave it chilling in the fridge over night wrapped in cling wrap. Remove butter from fridge 20 mins before you need to use it – if you are in very hot weather (Oz in summer) do this 5 – 10 mins before you need it. Mix the icy cold water with the sugar and the vinegar (ideally chill down the vinegar in the fridge) I added a little less water and an ice cube to make sure that the mix was VERY cold. Stir well to combine and leave for 10 mins. Sift flour and salt into a large mixing bowl. Chop the butter into 1 cm cubes and add to flour mix. Very gently rub the butter into the flour. You do not want the usual bread crumb look, it should be chunkier than that so do not over mix/rub the butter in. You should still be able to see the butter pieces. Once you have the mix to this stage turn out onto a clean work top (ideally stone or marble as it is colder). Stir the sugar, water, vinegar mix to make sure it is well combined and sprinkle over the top of the flour mix. Not it is important to work quickly here and also it is VERY important not to over work the pastry. Take the heel of your hand and smear the pastry mix across the bench. Gather and do this again. You should only need to do this a couple of times and then press the pastry together into a ball. 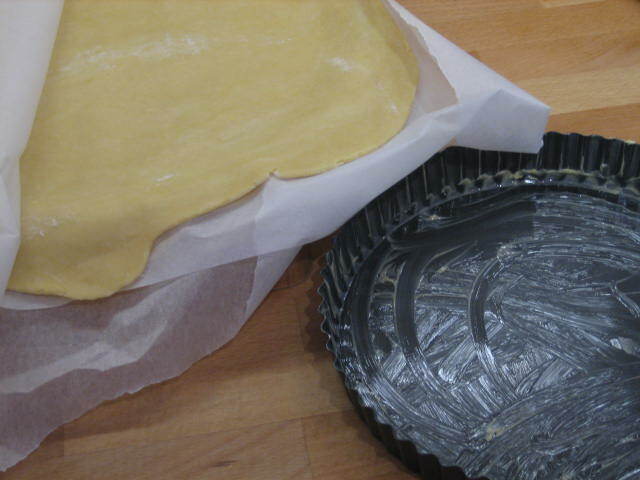 Flatten to a disc and wrap in cling wrap and leave in fridge over night (if you are not able to make the pastry the day before you can do it on the day but make sure you leave it to rest in the fridge for at least 2 hours). Bring pastry disc out of the fridge 20 mins before you wish to roll it out. Lightly sprinkle the bench top with flour (not too much). Gentle roll out to a large disc about 3 – 4 mm thick. Place pastry on a grease proof paper lined baking sheet and wrap in cling wrap and place in fridge again for another 2 hours. This is REALLY important and will ensure that your pastry does not shrink too much and that it is crisp. After 2 hours take a 24 cm loose bottom flan tin and grease with softened butter, I use a non stick one and grease it too just in case. Remove the pastry from the fridge and line the flan tin. 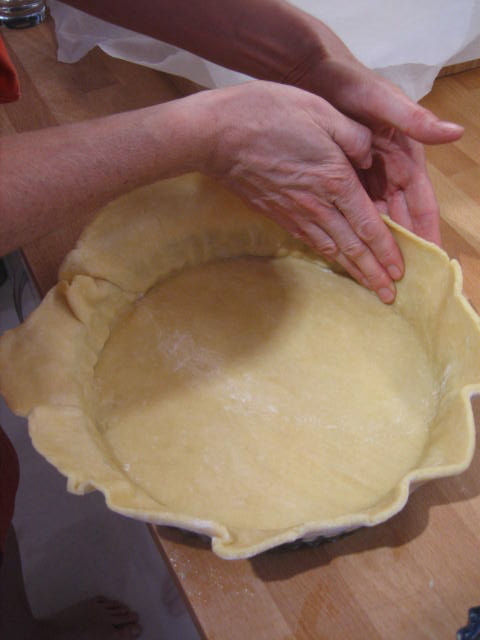 Press the pasty into the tin and push the pastry down the sides – this will also reduce the likelihood of the pastry shrinking. 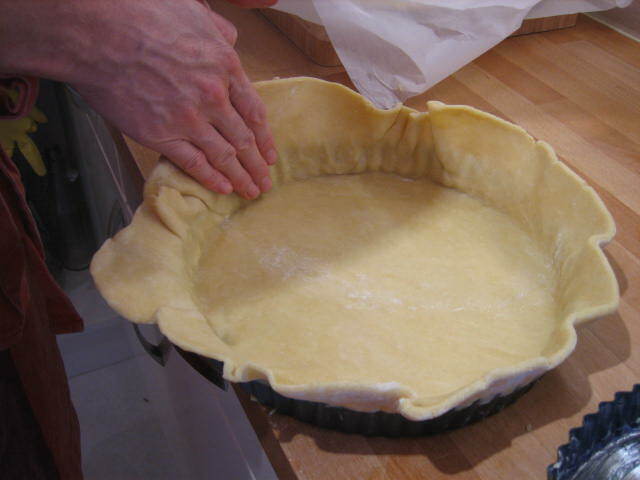 Cut the pastry slightly about the top of the flan tin and pinch the edge to finish. Wrap in cling wrap and place in the freezer for 20 – 30 mins. Bake in oven for 20 mins or until golden and crispy. Remove greaseproof paper and cook for another 5 mins. Remove from the oven and cook. 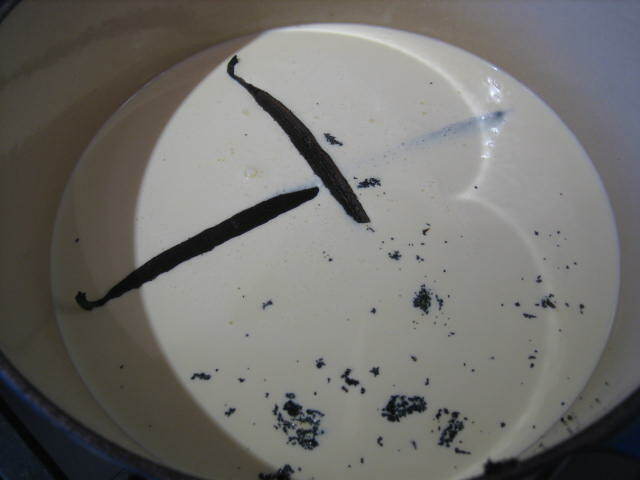 Put cream, washed/scrubbed and sliced ginger and vanilla pod and seeds into a heavy based pot. 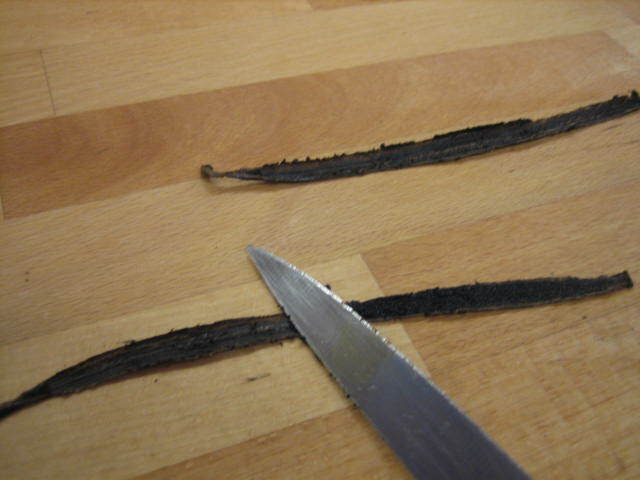 To remove the seeds from the vanilla pod flatten it as much as you can then cut it down the middle (like filleting a fish) and scrap the seeds out with the back of a knife. Scrap seeds into pot and add the pods too. Bring cream to the boil and then remove from the heat and rest for 10 mins. Separate eggs and put egg yolks in a large metal bowl, add sugar and whisk to combine. Take a medium sized pot and 1/3 fill with boiling water, bring back to a simmer. Pour the cream mix through a sieve and into the egg/sugar mix whisk to combine. Put metal bowl on top of the simmering water making sure that the water does not touch the base of the bowl. Whisk continuously until the custard thickens. Every couple of minutes make sure you take a spatula and scrap the sides down into the mix to ensure you do not get “scrambled” egg at the sides of the bowl. 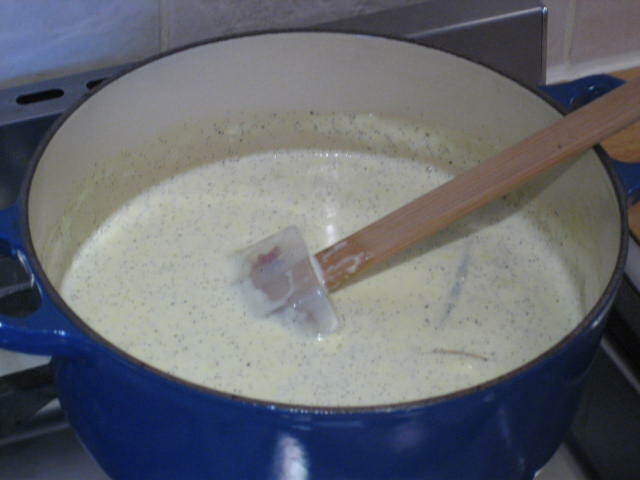 Once the custard is at this stage remove from the heat making sure you do not scald yourself with steam. Whisk ever 5 minutes until the custard has cooled. Decant into a bowl and cover with cling wrap. Make sure the cling wrap is laying directly on top of the custard mix to prevent a skin forming. Leave in fridge over night ideally or 4 hours if making it the same day. You can put it in the freezer for an hour to speed things along but make sure you stir it and replace the cling wrap after you then put it in the fridge. Wash and finely slice rhubarb and add to a heavy based pan with the sugar. Bring to the boil then reduce to a simmer until rhubarb is fully cooked and collapsed – this should take 10 – 15 mins. Leave to cool slightly then strain through a sieve. Remove as much of the syrupy liquid from the rhubarb as you can but make sure you keep this as for a pouring sauce. 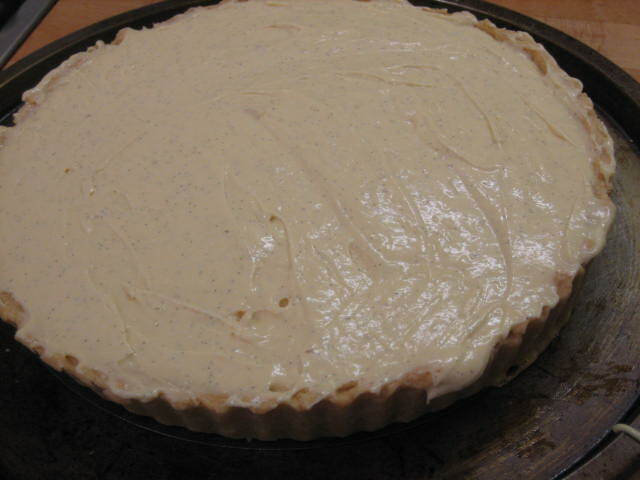 Once the pastry case has been baked and is ready, the custard is made and has been in the fridge for at least 4 hours (ideally over night), the rhubarb is strained and cooled you can assemble your tart. 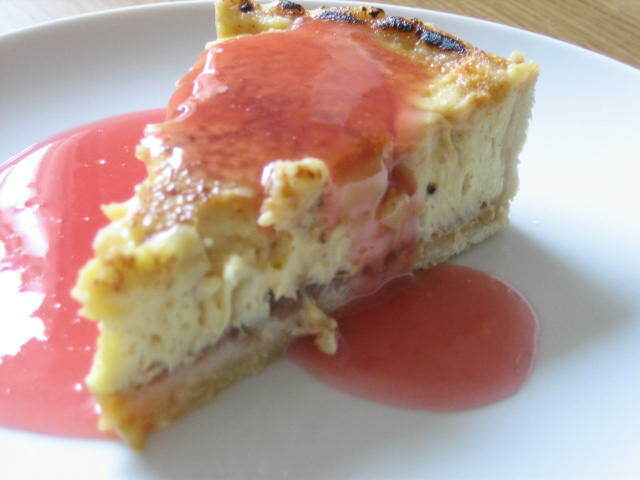 Spread the rhubarb puree evenly over the base of the tart then fill the tart with the custard and use a spatula or palate knife to spread evenly over the top and right to the edge. Ideally you want it to be flush to the top of the pastry edge even slightly covering the edge. This is to prevent the pastry burning when you brulee the top of the tart. 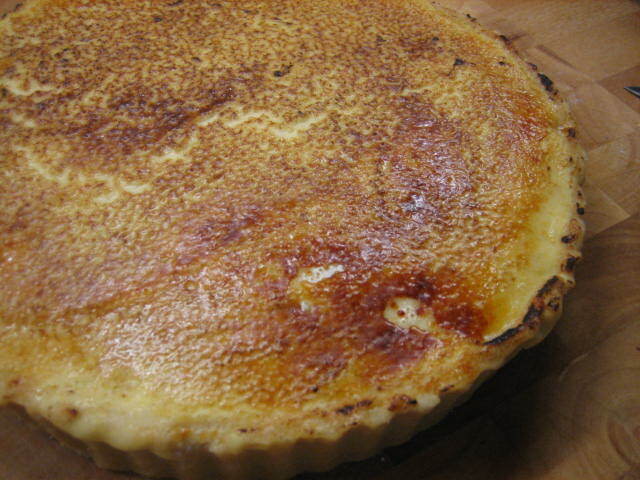 Use a small sieve and liberally dust the top of the tart with icing sugar. Brulee the top of the tart with a blow torch. Put the tart back in the fridge for another couple of hours to set again – the custard will liquify a little from the heat of the blow torch. Once chilled serve in slices with the rhubarb syrup poured over the top. It does seem like a right palaver but it is DEFINITELY worth it. You do not have to add the ginger if you do not like ginger and you can use different fruit if you do not have rhubarb e.g. Plum, quince, pear, apple, peach, strawberries other berries. If you are using berries you do not really need to cook them you can just blend them with some icing sugar then strain through a sieve. You may need to do this a coupe of times, first to remove excess seeds then secondly to remove water (maybe through a bit of kitchen paper). 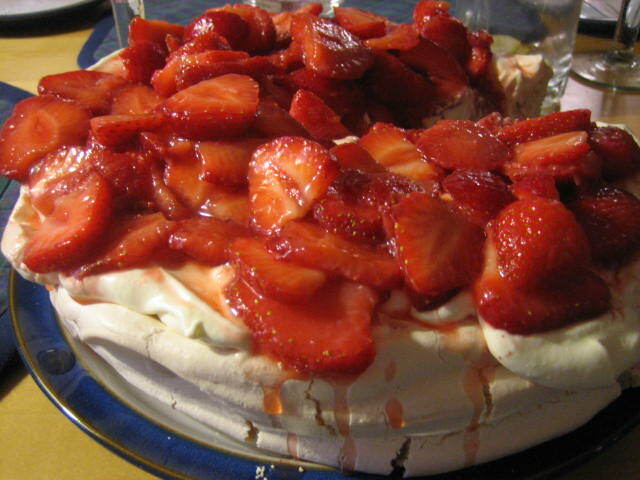 Meringue seems to send shivers up the spine of people who have not made it before. My brother-in-law LOVES meringue and keeps asking me to teach him how to make it. So here goes. All you need to remember is to be patient!! I usually wing it with my meringue recipes – approx 80 grms of sugar to each egg white a wee bit of vinegar and that’s it. However I was consulting my trusty “Cook’s Companion” cook book and Stephanie puts corn flour in hers so I thought why not give it a bash. AND just to let you know I will never look back! First things first get a large ceramic or Pyrex bowl – no matter if you think it is clean wash it again with lots of hot soapy water. It is essential that there is no hint of oil in the bowl or on the whisk as it will stop the egg whites from whisking properly. Separate the eggs and add the egg whites to the bowl (making sure there is absolutely no egg yolk). Whisk the egg whites until they form soft peaks, add in the sugar table-spoon at a time and whisk. The egg whites should become shiny and the silky looking. Add a teaspoon of white vinegar, two teaspoons of cornflour and a splash of vanilla extract (about 1 teaspoon) and fold through the whisked egg. Put some baking paper onto a baking sheet and dollop the meringue onto the baking paper making a rough circle approx 20 cm diameter. Try to ensure that it is quite even. Pop it straight into the oven and reduce the heat to 150 degrees Celsius. Cook for 30 mins. Reduce heat to 120 degrees and cook for another 45 mins. Cool in the oven. This is really important as it reduces the likely hood of the meringue cracking (it will still crack a bit but not too badly). While this is all happening finely slice the strawberries and put in a glass or ceramic bowl. Add a tablespoon of caster sugar and a slash of liqueur of your choice. Pop in the fridge to macerate. Whisk double cream with a dessert spoon of caster sugar and a 1/2 teaspoon of vanilla extra – whisk to soft peaks. Do not over whisk. 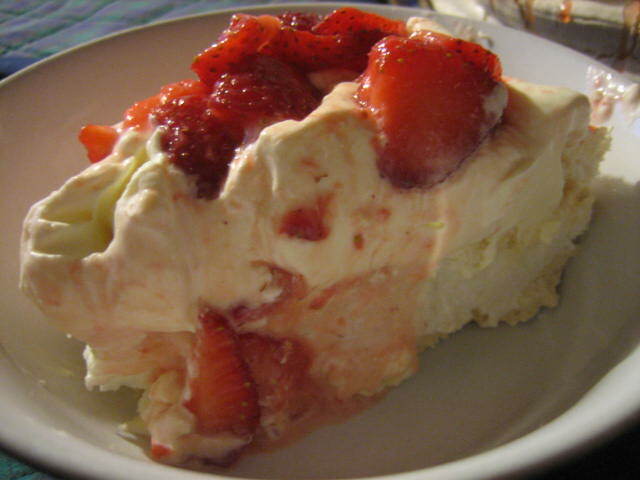 Once meringue is cool place upside down on a serving plate (so that you have a nice even base) dollop the cream over the top then spoon over the strawberries. I love cheese cake but there really does seem to be a lot of mucking around for something creamy with a bit of crumbly biscuit. Soooo I decided to make my own version the easy way with no baking, chilling and waiting. The eat straight away version!! Finely slice strawberries and leave to macerate in a bowl with a dessert spoon of caster sugar mixed through. Crush approx 10 digestive biscuits. Melt 50 grams of butter and add the digestive biscuits. Stir until biscuits are coated. Leave to cool. Toast the flaked almonds in a frying pan ensuring they do not burn (they burn easily so do not take your eye off them). Leave to cool. Grate 100 grams of white chocolate. Whisk cream with 1 dessert spoon of caster sugar until the cream forms soft peaks. Do not over whisk. Fold through raspberries (do not add any of the juice if there is any) and also fold through a 1/3 of the strawberries. 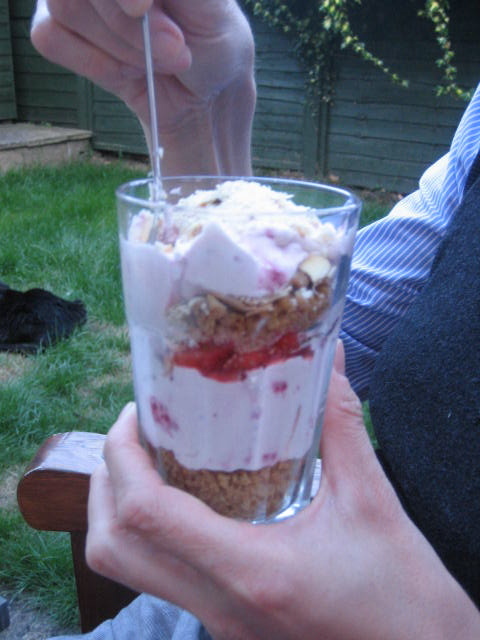 Find some nice sundae glasses or similar and layer up the ingredients as follows. Layer of biscuit crumb (approx table-spoon), sprinkle of toasted almonds, teaspoon of grated chocolate, 2 tablespoons of cream and fruit mix, table-spoon of strawberries. Then layer again and top with cream mix and some flaked almonds. I would recommend that these are made layered just before you serve so that the biscuit and almonds stay crunchy. I topped mine with grated white chocolate…..not a good idea as it looked like Parmesan (tasted good though). Tee hee. My sister and I popped into Sainsburys on Friday night to pick up bits and bobs to make pizza. On our way out they were giving out little strawberry shortcakes to promote strawberries which are in season. Never ones to say no to free food Fiona and I dug in. They had used a packet shortbread (Deans to be precise) some thick custard (Fiona thinks it was cream…) and a slice of strawberry. To our surprise it was really rather good. So when we were working out what to make for Sunday lunch dessert I suggested we make our own strawberry shortcake. We went to the supermarket and there were no bloody strawberries!!! Sods law!! Anyway after some debate about whether or not to “just buy a packet frozen lemon tart” (please NOOOOOOOOOOO!!!!!) 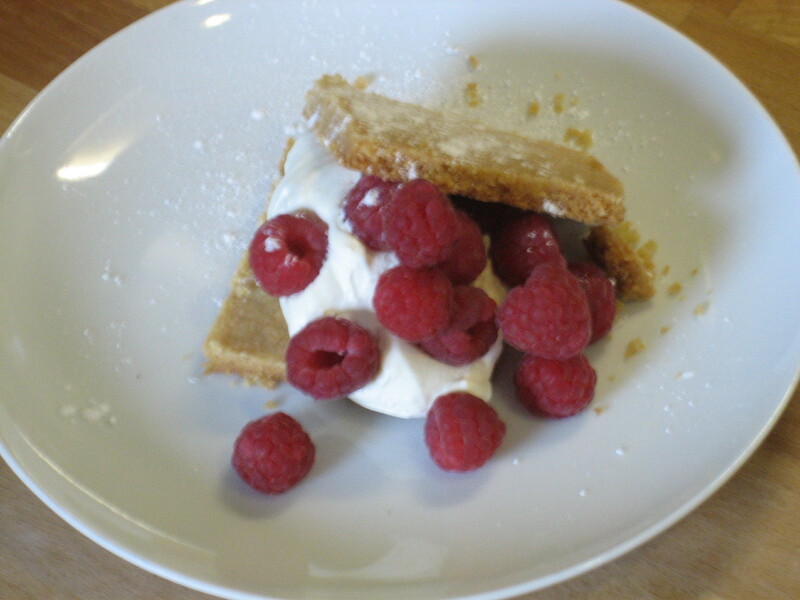 or not I managed to convince my sis that we could do the shortcake with raspberries instead. Anywho neither of us had made shortbread before so we consulted Fiona’s selection of fabulous cook books and Sue Lawrence (excellent Scottish cook) came up trumps with a relatively simple recipe. Fiona made the dough on Sunday morning before I had even woken up and pre running the Edinburgh 10 km race (well done Fee). After we had cooked the shortbread we were sure we had stuffed it up but miraculously it turned out perfectly and tasted absolutely amazing!! 1. Make the shortbread: Place the butter and sugar in a mixer or food processor and cream until pale. 2. 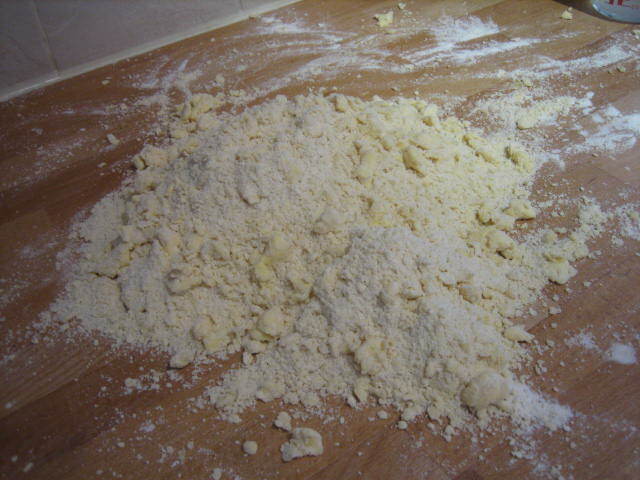 Once well amalgamated, add the flour and cornflour and blend briefly, just until thoroughly combined. 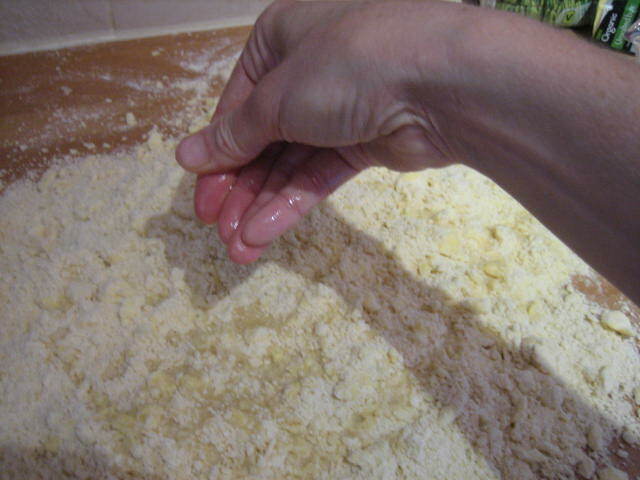 Tip into a buttered Swiss-roll tin (23x33cm/9×13″) and, using floured hands, press down so it is level all over. 3. Prick all over (do this carefully, so that you do not disturb the level surface) then bake at 150C/300F/Gas 2 for 50-60 minutes. What you are looking for is a uniform pale golden all over. Do not allow it to become golden brown. 4. Remove and dredge all over with caster sugar then cut into squares. Leave for 5 minutes or so then carefully decant onto a wire rack to cool. ******BTW we didn’t have any cornflour so we just added in a bit more plain flour AND ours was a wee bit browner than the recommended “pale golden” but still tasted fab AND we didn’t put any additional sugar on it – it really doesn’t need it as it’s super rich anyway. Also when it comes out of the oven you will think that you’ve done something wrong as it is soft “and shortbread is supposed to be firm! !” but don’t worry it will be ok once it cools. Add a few drops of vanilla extract and 1 teaspoon of caster sugar to the cream. Whip cream until it forms soft peaks. I cut the shortbread into approx 4-5 cm squares and put one on the base, a dollop of cream and a handful of raspberries on top then I placed another square on top. Then dusted it with a little icing sugar. Super easy, rather impressive and will definitely cook this again!!! The good things about this is you can cook the shortbread in advance and have it in an airtight tin ready to use when needed.